Building an underground rail line is complicated. But it’s interesting to see how it’s done. In this series, “The Anatomy of a Subway,” we’ll explore the different subway construction methods that will make the D2 Subway a reality. If you’ve been to our public meetings you’ve heard the D2 Subway team discuss different elements of the subway’s construction; including portals. There are two types of portals: pedestrian portals to access subway stations, and train portals. This part of the series focuses on train portals, which are the entry points and the exit points of subway cars from underground to the surface. 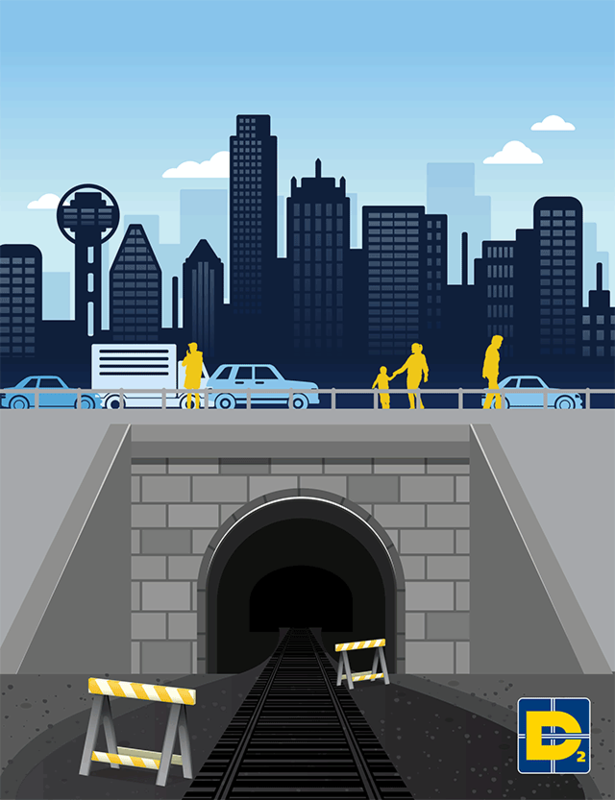 Just like DART Rail traveling between Pearl and Mockingbird stations, the D2 Subway will be underground as it travels through downtown Dallas and will be at the surface at either end to connect to the rest of the system. If you’ve had the chance to use the trains in New York, Chicago, Washington, Paris, London, or other major cities, you know what we’re talking about. See the map below to view the proposed train portal locations for the three alignments, Elm, Commerce, and Pacific. As you can see, a train portal is not a pedestrian portal to enter a subway station. We know that all the engineering elements that go into constructing this public transportation feat can get confusing, so make sure you catch the rest of our “The Anatomy of a Subway” series to learn more about our newest transit project!